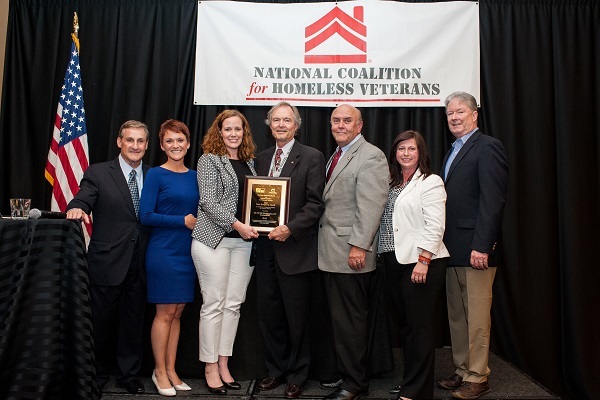 Peter Dougherty Award for Excellence in Supportive Housing for Homeless Veterans - U.S. VETS Washington, D.C. The Peter Dougherty Award honors its namesake – the personal advisor on homeless veteran issues for seven Secretaries of Veterans Affairs, one of the principal authors of the Five-Year Plan to End Veteran Homelessness, and the man who introduced The Home Depot Foundation to NCHV for the Veterans Initiative. This award is presented by The Home Depot Foundation and NCHV, and was originally announced during the 2013 NCHV Annual Conference. Pete Dougherty, The Home Depot Foundation, and the National Coalition for Homeless Veterans are proud to present this award and a grant award to U.S. VETS – Washington, D.C. for their new facility for homeless veterans that is changing the lives of not only the veterans they serve, but the surrounding community.